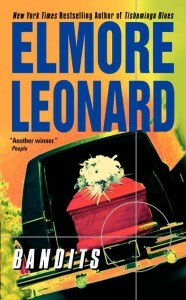 Reading Raylan got me in the mood for more Elmore Leonard, and in fact I’m now on my third Leonard book in a row. The second, Bandits, first published in 1987, tells the story of a convicted thief named Jack Delaney who works at a funeral home with his brother-in-law. Jack doesn’t much like driving a hearse, but he’s trying to make ends meet and stay on the straight and narrow after a stint in prison. That all changes one day when he goes on a job to a leprosy hospital to pick up a body and discovers that the patient – a girl named Amalita – is still alive. It turns out that Amalita is on the run from a murderous Nicaraguan colonel named Dagoberto (Bertie for short). Aiding her on her journey is a young, beautiful nun named Lucy who immediately fascinates Jack and ends up having a huge impact on his life. Lucy tells Jack that she isn’t actually a nun any more; among other things, she saw a massacre at the hospital where she worked, and decided it was time to get out of the country. More importantly, she brings Jack a proposal for a different kind of job, one with more serious implications than the thrill of sneaking into a hotel room to steal jewelry while the guests are sleeping. Dagoberto isn’t just in America to hunt down a girl, it seems; he’s also in the States to raise money for the fight against communist Sandinistas in his country. Lucy suggests they steal the money from Dagoberto, and the ball gets rolling. Jack recruits a few friends he knows from prison, and they start planning the heist. Where Raylan had crisp dialogue but flat characterization, Bandits finds Leonard at the top of his game, firing on all cylinders. The book is full of wonderful, fully drawn characters who practically leap off the page. My favorite by far is one of the colonel’s henchmen, a man named Franklin De Dios who is simultaneously likable and dangerous. Spending time with him and other characters quickly reminded me why I loved Leonard so much in high school. The other way that Bandits excels is the sexual tension between Jack and Lucy. Leonard draws out their scenes in a way that reminded me of the incredible flirtation scene in North by Northwest. Dialogues between Jack and Lucy are thick with tension and longing, skillfully intercut with descriptions and observations that are stunning in their simplicity. At his peak, Leonard has an economy with words that rivals Hemingway. My only criticism of the book is that the heist feels a bit anticlimactic. It’s not a big problem, though, because at its heart this book focuses on the characters. I loved Bandits, and especially recommend the audiobook version narrated by the late Frank Muller, who is an ideal choice for Leonard’s style.